The major question about Gordon Hayward is does he help the team or hurt it when he is on the floor. Well, the answer for his last three games is that he helps win games. In the last trio of contests in which he has played, the Celtics have a 2-1 (67%) winning record - and his plus/minus is a +15.7. That Plus/minus is good enough to be ranked 59th in the league for the 3-game period, and his True Shooting Percentage is 60.2%. As the tweet below indicates, the Celtics are 10.2 points better with him on the court since he moved to a bench role. The Celtics have a +10.2 net rating over 108 minutes with Gordon Hayward on the court since he moved into a bench role. 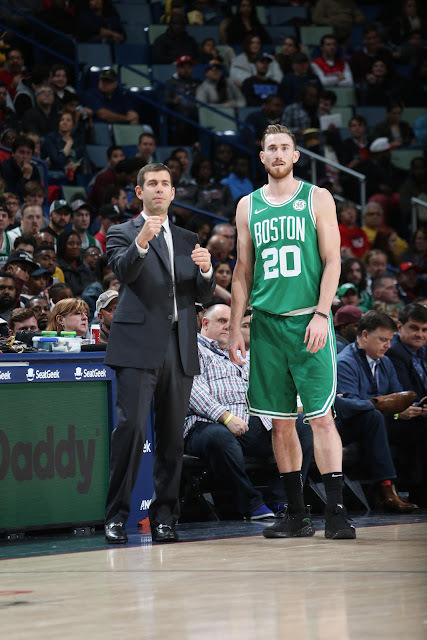 For the last three games, Hayward is averaging 25.6 MPG, 11.7 PPG, 5.3 RPG, 3.7 APG, 1.0 SPG and 1.0 BPG - with only 1.7 turnovers per game. He is shooting 46% from the field, 33% on treys and 100% from the free throw line. Only three games his critics may scream. But they are the last three contests, and that is what matters. He is clearly not 100%, but should no longer be looked upon as being a detriment to winning.